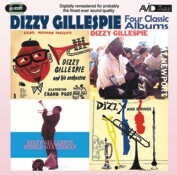 Dizzy Gillespie At Newport, Dizzy And Strings, World Statesman and Gene Norman Presents Dizzy Gillespie And His Orchestra. Recorded at the Newport Festival in 1957 and arranged by Quincy Jones, our first classic album finds Dizzy in the company of his big band including such greats as Pee Wee Moore, Wynton Kelly, Benny Golson, Lee Morgan and Billy Mitchell. Our second album finds Dizzy again with the big band but this time accompanied by a string section arranged by old associate Johnny Richards. For the second side (isnt it great to talk about album sides again!) Dizzy is joined by Buster Harding as writer and arranger and soloists Lucky Thompson and JJ Johnson. Our aptly titled third classic album Dizzy Gillespie World Statesman (which is what Dizzy would certainly go on to be!) contains the music that would make warm friends for the USA in the Middle East when Dizzy and his Orchestra (which included Quincy Jones, Phil Woods and Walter Davis) made a State Department tour of Pakistan, Iran, Syria, Yugoslavia, Turkey and Greece. Finally and triumphantly, we have the 10" LP version of the classic Gene Norman Presents Dizzy Gillespie And His Orchestra album featuring Dizzy and his big band quite literally blowing the audience away as they bought the New Jazz Bop.. to the West Coast. Featuring a band who would help to point jazz in the new direction including James Moody, Ernie Henry and Cecil Payne. We must also mention the legendary percussionist Chano Pozo who died soon after this gig which was to be his last recording. Chano was one of the pioneers of what would become the Afro Cubano rhythmic sound.